How Fresh Are Your Trees? The knowledge of ways to keep trees fresh does little unless it is thoroughly implemented. Even partial care will result in trees that dry out or exhibit problems. One grocery store invested in shade cloth frames to protect the gaps between columns at the front of the store. However, for appearance, an eight-inch space was left between the shade cloth frame and the building. The result was about an eight-inch brown sun-scalded streak across all the front trees. A good plan will integrate the knowledge of what keeps trees fresh with careful manipulation of the site. What will uniformly reduce exposure, decrease temperature and light, and increase humidity? By working through the following questions as a team of those responsible for caring for and selling Christmas trees, you should be able to evaluate existing conditions and modify your site appropriately. Each site has its own constraints to work though with the need for a unique plan. By working on it as a team, all employees who care for the trees will understand why the lot is set up as it is and how trees benefit. 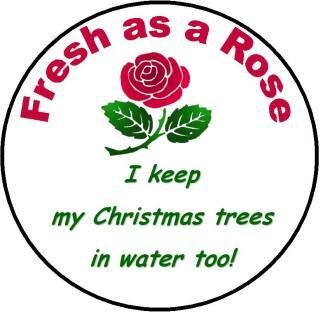 Last year, were your trees as fresh as they could be? 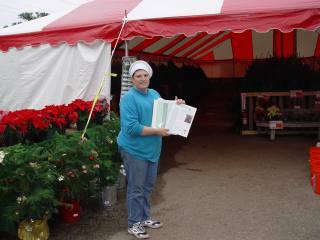 What is your Christmas tree care history (problems, culls, returns)? What successes did you have? What can you do better compared to last year? What tree care practices could you effectively implement on site? What is “impossible” to do at your store or retail lot? What resources do you already have to keep trees fresh? What other resources do you need to keep trees fresh? How can you best use all of these resources? How would you rate your own customer service? What training goals do you need to set? How are you going to evaluate your care and service this coming year? There is inherent value in keeping trees fresher for your customers. However, as long as you are “going the extra mile” to keep your trees fresh, you can promote the fact that you do implement extra freshness practices. Make sure every customer knows it. Talk about the extra shade, water, and mulch. 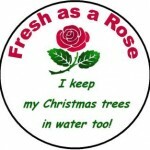 Print up stickers or buttons that emphasize tree care, such as the rose button shown here, for your employees to wear. Include statements to that effect in any advertising. Use it to separate yourself from the competition. Done right, freshness should be a defining character of your business that is central to your reputation as a Christmas tree retailer. • How to Make Your Centipede Lawn Look Better than Your Neighbor’s! This website is designed as a one-stop-shop to provide comprehensive information to growers, retailers, consumers, and anyone else interested in Christmas trees in North Carolina. Programs at NC State University emphasize the safe, sustainable, and profitable production of Christmas trees through research and extension programing.